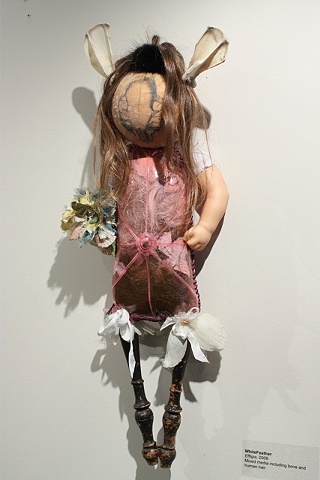 Bone, human hair, beeswax, plastic, found plastic and cloth doll arms, found gourd, silk, rabbit fur, deer fur, found finch head, found funerary flowers, silk ribbon, found wooden music stand legs, wool, waxed linen. Effigia's face is an image of a cat skull, viewed from the top. My old pink plastic umbrella is the body, with a hair peeking out the belly button hole. Her morbid bouquet is of flowers collected from a stroll through a nearby graveyard while visiting a friend. Two peg-legs made of an old music stand means you can hear her coming in the dark. Her rabbit ears are actually two rabbit shoulder blades, affixed to her gourd head with ribbon. Robust doll arms make her look pretty tough, but you can see for yourself how soft she is inside. One little finch head is nestled in fur near her heart.